I started out the day by buying a new pair of Orvis River Guard wading boots, because I tossed my two pairs of oldies with the felt soles. I’m already regretting that decision. Sure, Trout Unlimited and the country of New Zealand want you to ditch your felt. And, yes, every time I’d see the sign from the DFG on Hot Creek, and read about freezing my boots (which, BTW I didn’t do …. who does?) to kill the nasties, well, you get the drift. But, hey, maybe they would have been good for gardening, or scaring young children at Halloween. So today, there I was with a mismatched pair of Red Ball leg waders that would look great on an athletic pole dancer, but not so terrific on yours truly and new boots with “Vibram EcoTraX” soles. Nobody noticed, not even the ladies who were getting hay at the local hay shop next to Victory park (Another item from L.A. you wouldn’t expect). Nothing like catching that first fish on a new reel. Next purchase: a bigger net. 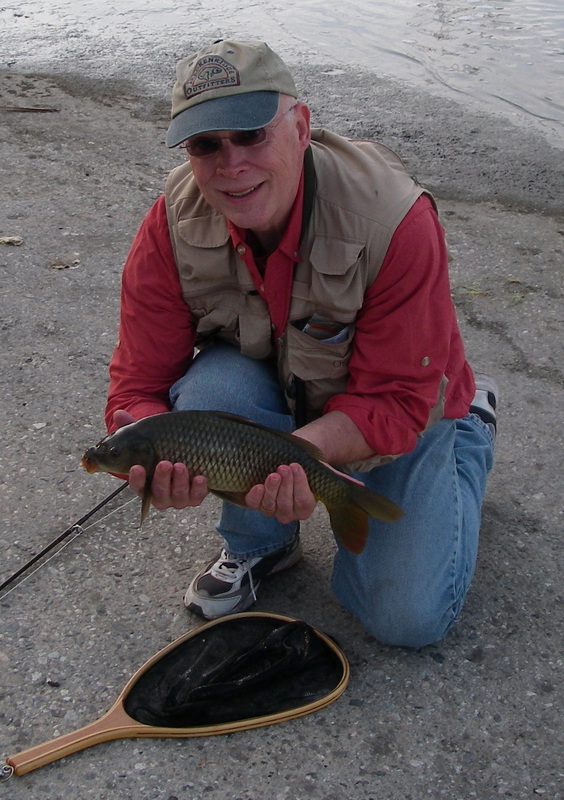 At Orvis, I met manager Dave Shaffer, who suggested trying the river below the Victory Boulevard bridge. I did. I was skunked. Not his fault. I managed to miss the two fish I did sight, and when this happens, it’s both humbling and frustrating, not in equal measures. Think I took the long way around to my actual thought for this post — fishing before work. Granted today I didn’t have to clock in, so maybe that had something to do with getting skunked. No matter. Several Fridays ago, when guide and buddy David Wratchford took this photo of moi, we talked about the general awesomeness of fishing before work. Once years ago, I was in Medford, Ore., en route to the Rouge River to kayak. A high school teacher and I got to talking, and he told me what a thrill it was to hook up before going to earn a living. At the time, I couldn’t stand the guy, not because of his tone, his demeanor, his haircut, or anything else about him. My contempt was situational. In other words, he lived in a place where fishing before work was possible. I didn’t. Where did I live at the time? L.A.
Was there a river running through it during the Pleistocene? Yes, thank you very much. Did I know about it? Huh? Know about what? Don’t let this happen to you, kids. 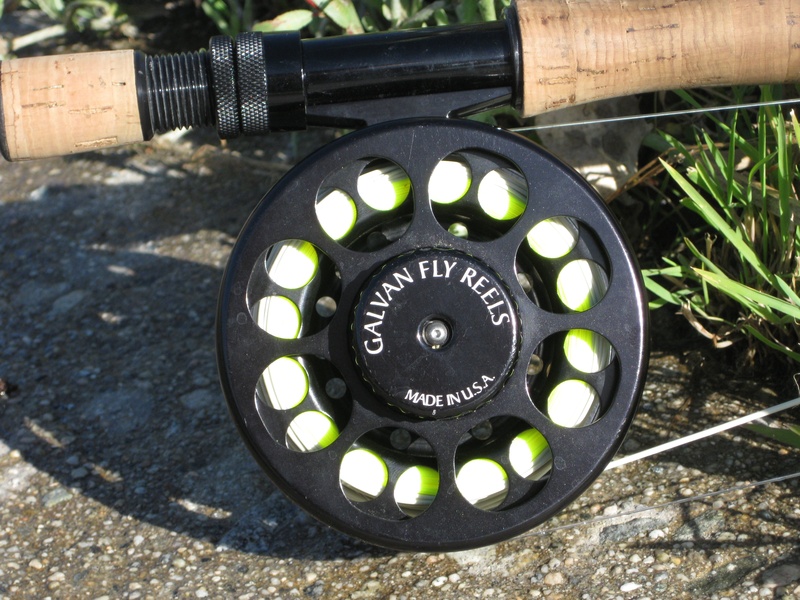 This Galvin 8 Wt. still makes me a little nervous. But the mojo it puts on carp is truly phenomenal. So, as David and I walked back to our separate rides at the Red Car pocket park next to the Hyperion Bridge, the rubescent glow of a new morning illumined our smiles. True, I was smiling because I’d caught the first fish on my new Galvin Rush Arbor reel, fitted with Sharkskin, the zingy, singing line. For him, well, I don’t know David well, but I get the feeling every time he’s on the river — any river — the thrill is like getting to fish before going to work. Except this time, that’s exactly what he was doing. “Ahhh, don’t get me muddy,” he said to his second carp of the morning as its mighty tail paid him back for interrupting a leisurely breakfast. You gotta love it when you can fish in your work clothes. But that’s where he’s got us, civilians. You can see him most days at Fisherman’s Spot in Van Nuys.